Located in sunny Florida, VU-FLOW FILTERS is a U.S. Manufacturer of high quality water filters for 20+ years. Our filters are used successfully in many applications such as well water to irrigation, homes, businesses or farms and industrial well water for cooling towers, wastewater, and drinking water. The clear cover on our filters allows an instant view of the filter cartridge and collected sediment. A ball valve flushes away sediment with a simple quarter turn of the valve handle. The filter cartridge is cleanable and reusable eliminating expensive element replacement. We also offer high performance filters with chemically resistant covers and purple filters for reclaimed water applications. By combining our expertise in filtration products and our commitment to outstanding customer service, we are able to deliver a filter that makes sediment removal simple and economical. In an increasingly crowded world, the need For clean water concerns everyone who wishes to sustain our quality of life throughout the 21st century and beyond. 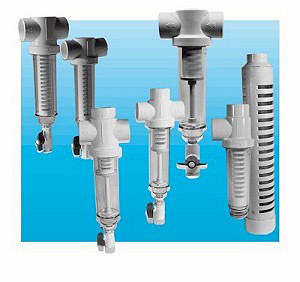 For more than 40 years, Amiad has helped meet this need by developing a comprehensive line of exceptionally efficient automatic self-cleaning filters and manual filters For use in industry, municipalities, and irrigation. Combining creative solutions with practical applications, Amiad provides optimal solutions For every filtration requirement. 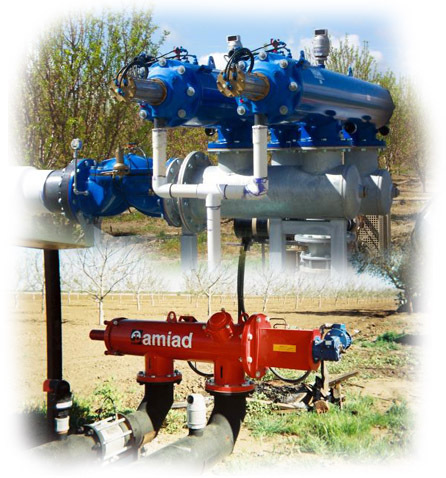 Serving the industrial, irrigation and municipal sectors worldwide, Amiad provides solutions to more than 66 countries, with seven subsidiaries and sales offices. Amiad’s pledge to the filtration market is to continue to provide innovative and dependable products, quality service and reliable customer support. Our vision is to help our customers reach their potential with clean water. Founded in 1962, Amiad Headquarters today covers over 40,000m² including an Injection Molding Plant, Production and Assembly Halls, Warehouses and Office Space, containing an international filtration training center and research laboratories. Amiad Filtration Systems is one of the world’s most significant producers of water filtration products and filtration solutions. Through strategic acquisitions, international expansions and substantial research and development investments, Amiad continues to strengthen its technology and market base. Now in its fifth decade of successful designing, manufacturing and marketing, Amiad Filtration Systems has established a worldwide reputation. The company is known For its high-quality standards, prompt delivery, and consistent availability of parts. It is renown For unprecedented expertise in its chosen areas of endeavor: sophisticated water filtering equipment, and high-efficiency systems For Irrigation, Industry and Municipal purposes. Thousands of filters and filtration systems have been installed around the world. Fortune 500 companies, government agencies, and small businesses rely on Amiad To solve their water filtration problems. Amiad technology is used For a wide range of solutions, with manual, semi-automatic and automatic filters installed across a broad spectrum of market segments. Product upgrades and new products are released on a regular basis, guaranteeing increased efficiency and ensuring that the company will continue To be an innovator in the field. Amiad offers custom-made systems that are designed and constructed For special needs of the various market segments such as: automotive, offshore, ship ballast, pulp & paper and aquaculture, To name just a few. Customer support services are offered 24/7 To ensure clients reach their maximum clean-water potential. For detailed product information, please visit Amiad’s products section or search For a product To suit a specific need. To view selected installations worldwide, visit the extensive solutions section. Flexibility of control options: Hydraulically or electronically controlled units. Electric control boards to suit specific needs: flushing according to pressure differential and/or according to time, continuous flushing, alarm signals, flushing counter and more .